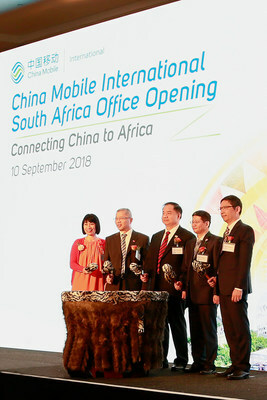 DURBAN, South Africa, Sept. 11, 2018 /PRNewswire/ — China Mobile International Limited (CMI) hosted the opening ceremony of its South Africa office in Durban, and the office is located in Johannesburg, South Africa. Mr. Chen Zhaoxiong, Vice Minister of Industry and Information Technology of the People’s Republic of China; Mr. Zhao Zhongyi, Economic & Commercial Counsellor of Chinese Embassy in South Africa; Mr. Godfrey Motsa, CEO of MTN South Africa; Mr. Jian Qin, Executive Vice President of China Mobile Communications Group Co., Ltd.; Mr. Shen Weizhong, Director & Executive Vice President of China Mobile International Limited, as well as representatives from Chinese and African governments, enterprises and telecom operators attended the ceremony. Mr. Chen advised that South Africa is one of China’s important partners, the cooperation between two countries in terms of information communications has been continuously improving in recent years. The “eight major initiatives” announced by Chinese President Xi Jinping at the Forum on China-Africa Cooperation has opened up broad opportunities for China and Africa to expand cooperation in various fields. China Mobile is expected to adhere to the concept of win-win cooperation and compliance management, to provide high-quality and convenient services that will better benefit local people. Starting from this, China Mobile should continue to promote cooperation with other countries and contribute to the development of China-Africa relations. The Ministry of Industry and Information Technology will further strengthen cooperation with communications authorities of South Africa, and jointly bring the information and communication cooperation between China and South Africa to a new level. Mr. Godfrey Motsa, CEO of MTN South Africa said he believes that with the partnership between MTN Group and China Mobile International, the cost of telecom services will be significantly lower, especially roaming, leveraging the shared technology and innovation of MTN and China Mobile, it will be easier to everyone to do business without boundaries for the future. Mr. Zhao indicated that, as the top mobile operator in China and the world, China Mobile’s decision to enter South Africa will undoubtedly add new power to the facility construction between two countries. It is hoped that South Africa can the gateway for China Mobile to strengthen the southern African market while further influencing the entire African market. At the same time, the Chinese Embassy in South Africa will continue to provide support to Chinese enterprises to invest in South Africa, and work together to build a monument and model for China and Africa cooperation! Mr. Jian mentioned that in response to the “eight major initiatives”, China Mobile will enhance infrastructure interconnections between China and Africa. The establishment of South Africa office represents a new milestone for CMI’s development in South Africa and Arica. China Mobile will enhance technical exchanges in terms of 5G networks and IoT etc., thus providing high quality telecom services for customers in China and Africa, and make due contributions to deepening cooperation between China and Africa. On the same day, CMI also signed a MoU for strategic alliance relationship with MTN Group, the multinational mobile operator in Africa with up to 230 million subscribers and 23 operating companies across Africa and the Middle East. The two companies will collaborate on international business expansion, international transmission interconnection and network resources sharing etc. The MoU takes CMI one step closer to meeting its goal of an interconnected world that includes Africa. With increasing abundant submarine and terrestrial cable resources and professional competence and products, CMI plans to partner with African operators to create an open and cooperative platform while further deepening the partnerships to provide comprehensive international telecom services and solutions for customer. China Mobile International Limited (CMI) is a wholly owned subsidiary of China Mobile, now the largest telecom operator by network scale and subscriber base. In order to provide better services to meet the growing demand in the international telecommunications market, CMI was established in December 2010 in Hong Kong, mainly responsible for the operation of international business, and has expanded its footprint to 21 countries and regions around the world. To date, CMI owns 40+ terrestrial and submarine cable resources worldwide, with total international transmission bandwidth exceeding 30T as well as 138 POPs covering 91 hotspot cities worldwide. With Hong Kong as a starting point, CMI has significantly accelerated core IDC development globally, enabling a strong network for cloudification of data centers. Leveraging the strong support by China Mobile, CMI is a trusted partner that provides comprehensive international telecom services and solutions to international enterprisers, carriers and mobile users.